Congratulations Pete, here's to another fifty years of health, wealth & happiness! Have a fantastic day! It'll be alright! Happy Birthday!! Thank you for sharing all your terrific drawings here with us! Happy Birthday. That is a really great characature of you.One of the best. Not only of yours but in general.Great appeal. 50 is the new 30! Happy Birthday Pete! 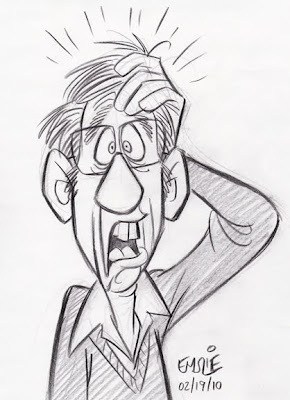 Great self caricature... awesome blog, glad I found it! Happy Birthday Pete, have a good one! Time for that 50,000 mile check up.Nice drawing.Best fifty more to you. Bawb. hey! happy b'day! ur videos are awesome!! keep them coming. Happy Birthday! Thanks for all the entertainment and insight! happy birthday pete! five-oh and go! cheers! Happy closer to retirement day. "Just a few more years and you finally reach the American dream, getting paid to do nothing and yelling at kids to get off your lawn!" Congratulations! and Happy Birthday, I'm a fan. Happy Birthday, Pete! a great mentor to a vast brother-sisterhood of cartoonists and animators! may your next 50 be EVEN more amazing! Fifty? You're still a kid. I remember being driven around Burbank by a 91 year old, Joe Grant. I was a little bit concerned because I think Joe was getting on in years. However, he never thought of himself as old. Although I don't post too often, I've been a frequent reader of your blog and it's been a real service to me. Thanks. Happy belated Birthday Peter. May you live to grace us with atleast another half century of amasing art. congrats pete! Great drawing as well, I can really sense the panic. Wow! I'm new to this. Love your work. Happy Birthday Old Man Pete. Belated greetings - it doesn't get any easier, believe me! Oh my, Pete! Sorry i've missed this! You look much younger, i never would have guessed!